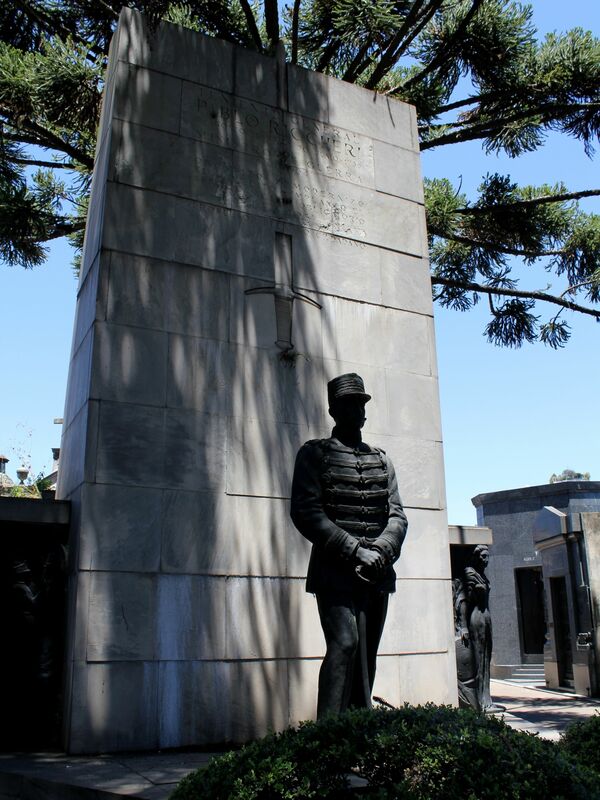 Recoleta Necropolis - famous Buenos Aires cemetery, place of final rest for rich, powerful and celebrities, story of Rufina Cambaceres, Carlos Pellegrini, Federico Leloir and others,. Another story, probably the most horrifying is that of Rufina Cambaceres – a young lady mistakenly pronounced dead on her 19th birthday and buried alive. At those times - about hundreds years ago, it was customary to be buried the next day (probably due to the local climate conditions). Tragically for Rufina the burial turned out to be premature -apparently she suffered an attack of catalepsy not recognized by doctors. 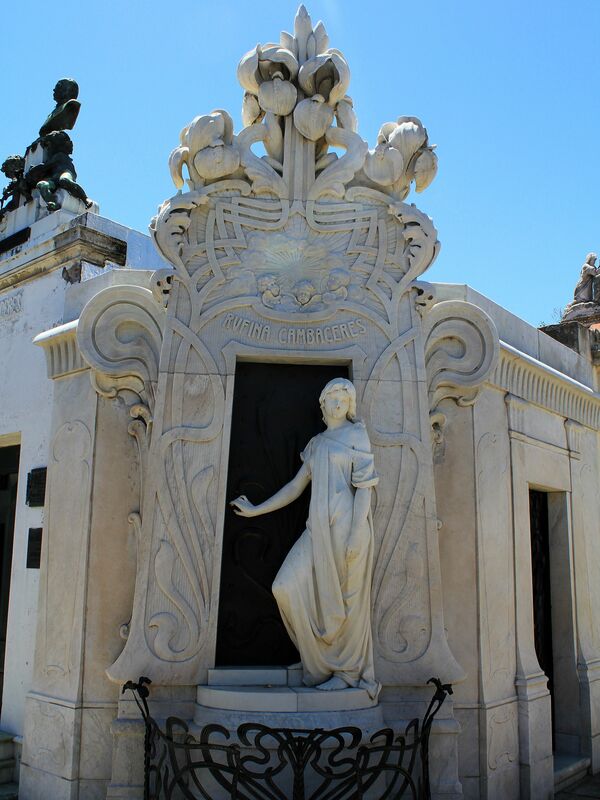 The beautiful white-marble mausoleum with Rufina’s life-size statue standing in front of the crypt and trying to open the crypt’s door captures attention of visitors. She looks like she is about to break into tears, a feeling often shared by many passing-by visitors…. True or already a myth – they say that for years her mother was seen coming to the vault and spending there long hours like in an expectation that one day her beloved daughter may knock the door….. They say that following this tragedy the burial law was changed to protect against repetition of such horrible incidents. 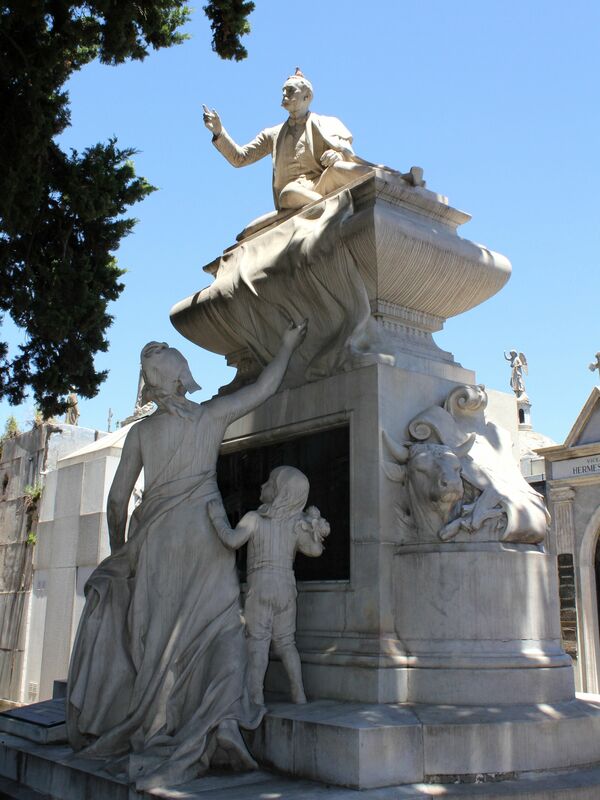 Another beautiful monument with allegoric scenes is that of Carlos Pellegrini. A man of virtues with some military background became the President of Argentina in 1890’s in the middle of a deep economic crisis. Although he is mostly seen as a defender of the upper class interests, by successfully navigating the country through the crisis he is a well respected political figure in Argentinian history. The marvelous white marble mausoleum shows him in a life-size posture atop of the coffin issuing orders (ah, some politicians never take retirement!…). A female figure and a child at his feet symbolize the Republic of Argentina – in its present and future times. Luis Federico Leloir was born to Argentinean parents in Paris (France). 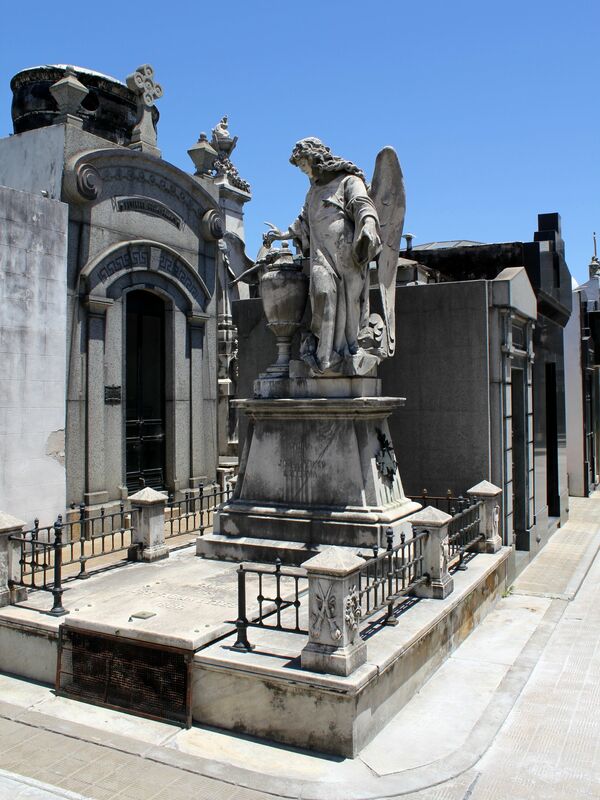 Shortly after, the family moved back to Buenos Aires where Luis spent most of his life. He became a renowned scientist receiving in 1970 the Nobel Prize in chemistry for his contribution to understanding how the body converts carbohydrates into energy. 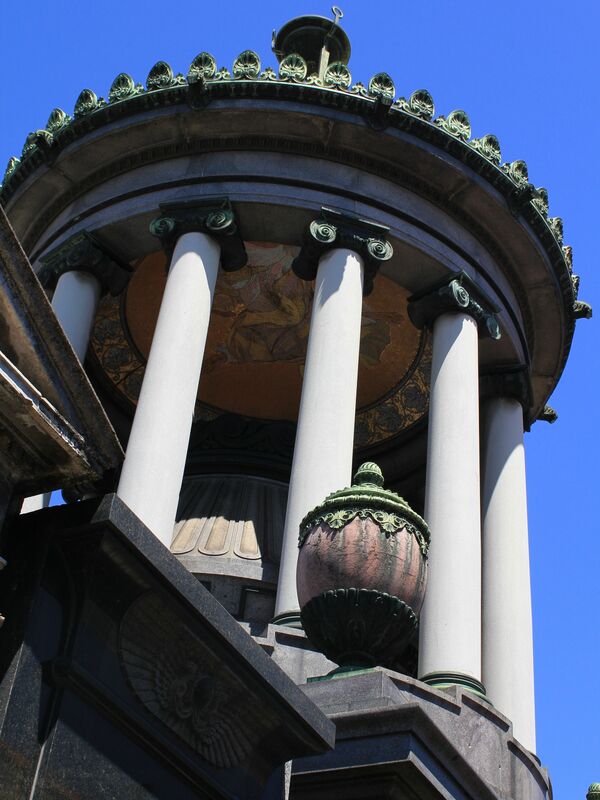 His mausoleum in Recoleta is rightfully considered as one of the most beautiful and sophisticated. 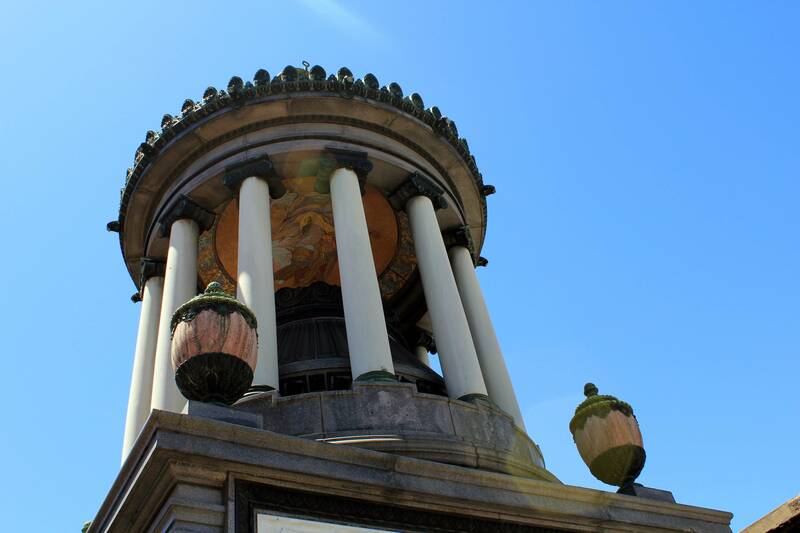 It consists of three distinct segments – cubic base from the granite, holding a gigantic drum made of bronze and an “open” dome supported by columns. Through the built-in skylights it provides light to the inner chapel. The ceiling of the dome finished in little ceramic tiles presents the icon of Christ Redeemer. The vault was designed by the French architect A. Guilbert. 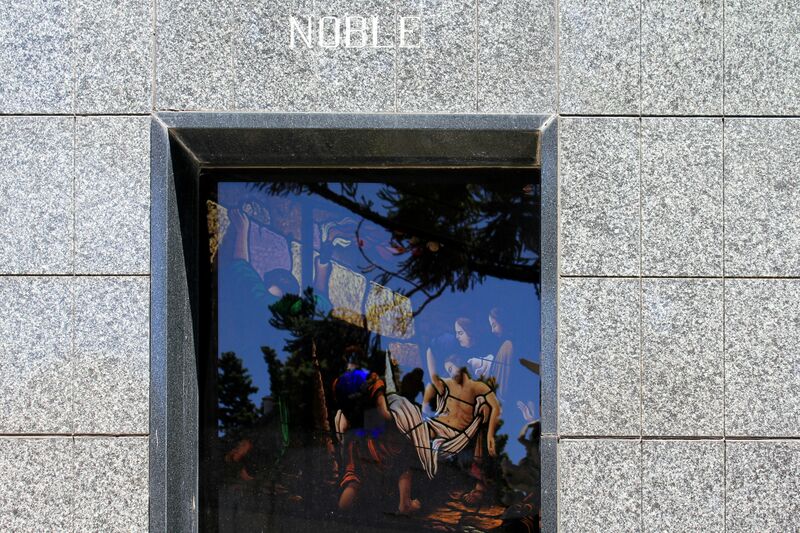 The chapel holds the work of the famous Italian sculptor and painter - Leonardo Bistolfi. Now after these painful stories there is time for some “humor” (even if it is still in “black”). 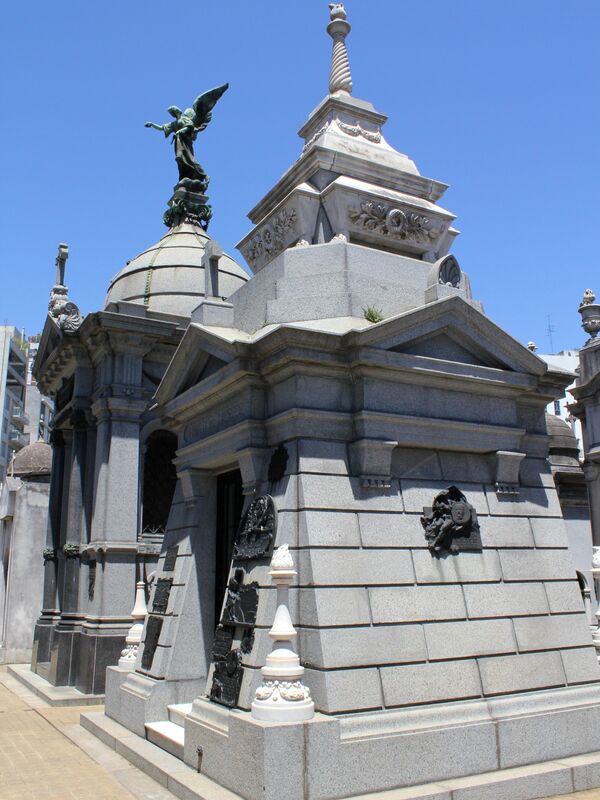 The mausoleum of the Familia Carril holds bodies of Salvador Maria del Carril and his wife Tiburcia Domínguez de Del Carril. 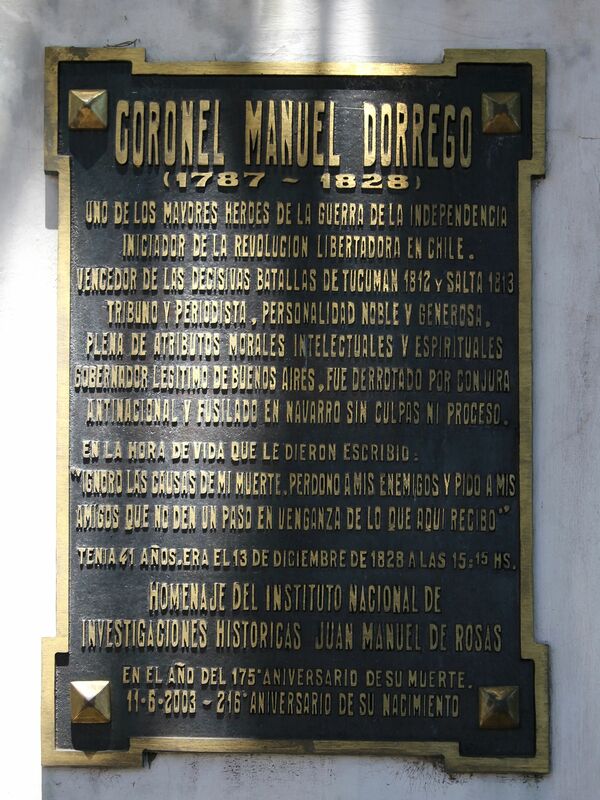 He is remembered for his role in the infamous condemnation of Manuel Dorrego to death. 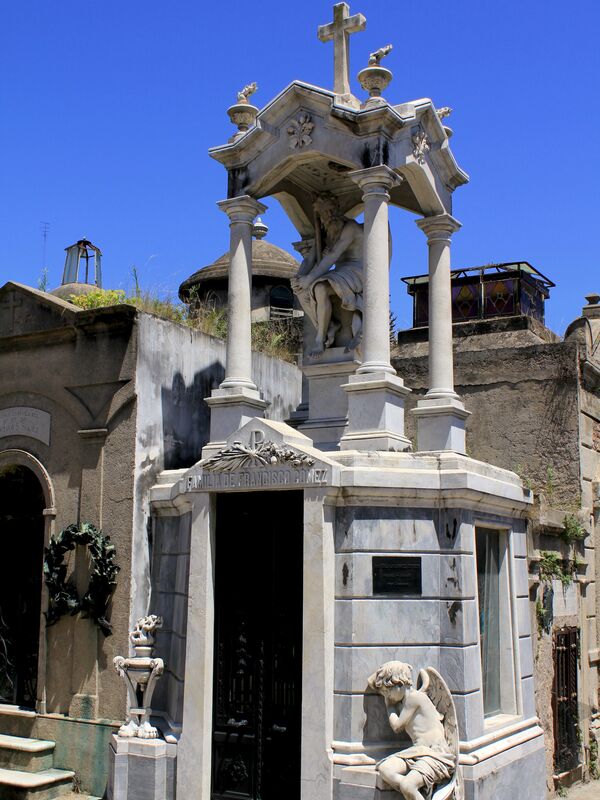 The mausoleum, made in form of an enormous baldachin is topped by a figure of Chronus (Latin) or Khronos – a symbol of Endless Time (in his left hand you can see clepsydra -an ancient device used for measuring time). 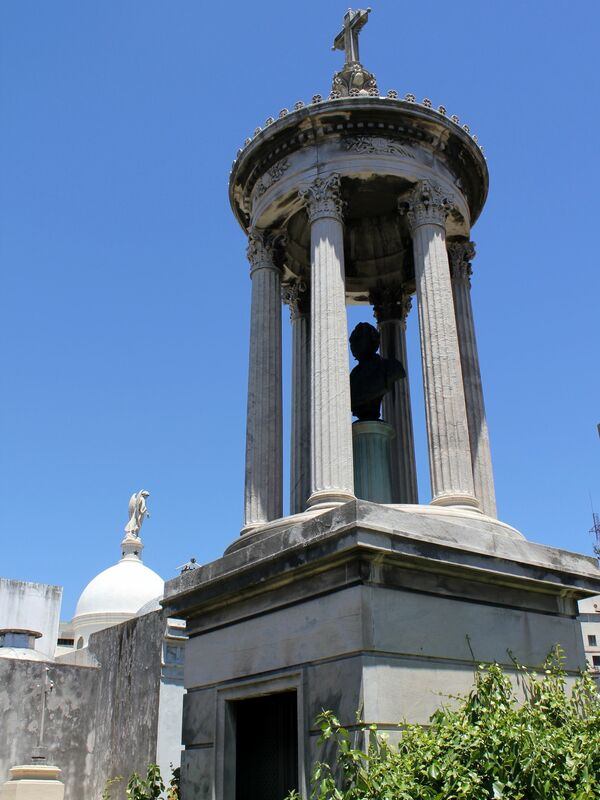 Under the mausoleum’s canopy there is a sculpture of Salvador Del Carril comfortably sitting in the sofa and behind him a bust of his wife Tiburcia looking in the opposite direction. Sculptures are work of Camilo Romairone. Apparently that is what she asked for in her testament - to represent their marriage in which they spend years without speaking a word to each other….. Some may see it funny, but it is rather deeply sad. 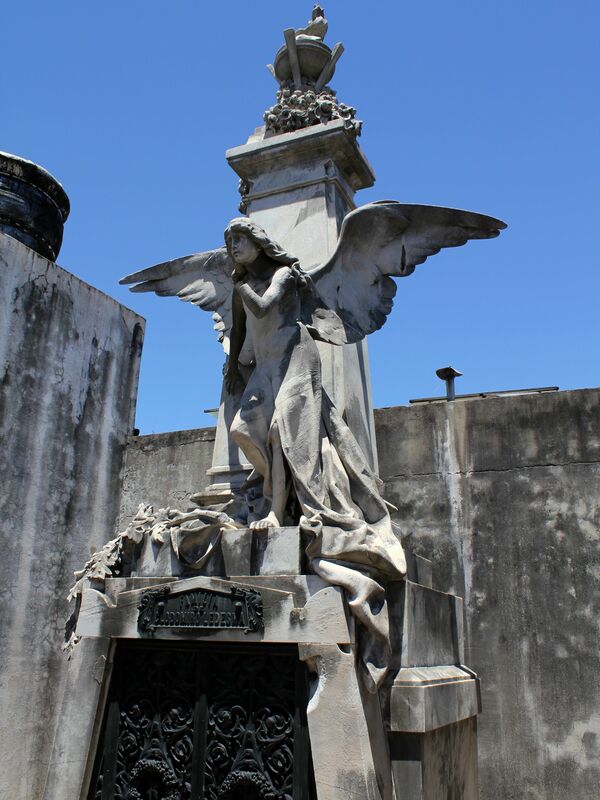 Although these sculptures in a way immortalized them for generations to come, the truth is that they lost their lives long before passing away….. Like many other monuments in Cementario Recoleta, this one may be a lesson for all of us…. Do not “get buried” when still alive! 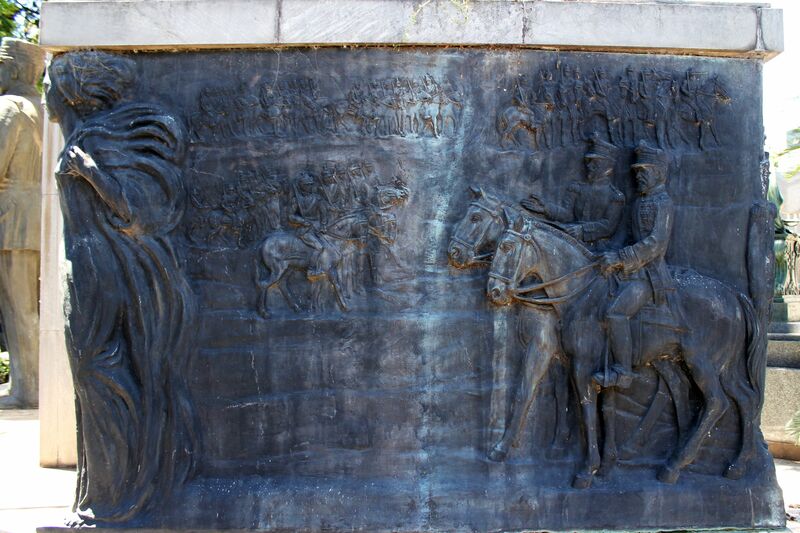 Manuel Dorrego, was a hero of Independence Wars, heading infantry in famous battles of Tucumán and Salta. 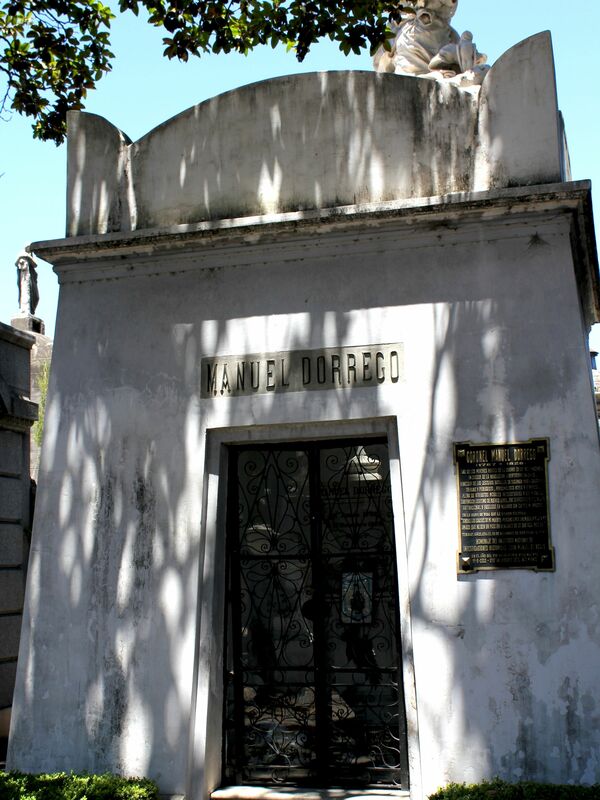 Tomb of Manuel Dorrego and an inscription plaque. ….My dear Angelita -within a few hours I will be shot and still do not know why… I’m forgiving my enemies and begging my friends to avoid any vengeance for what happened to me. 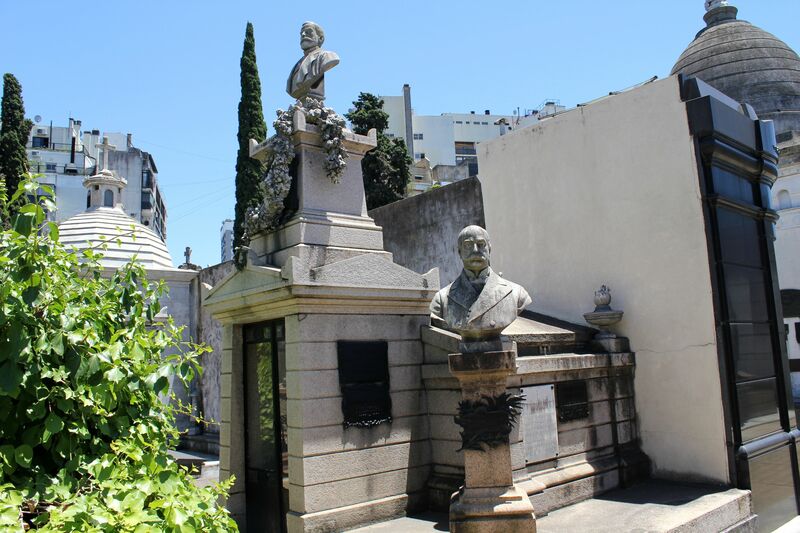 One year later he was buried with honors in Recoleta Cemetery by his friend Juan Manuel de Rosas. It will be difficult to write just few words about Domingo Faustino Sarmiento. Shortly – first of all he was an Intellectual, Philosopher, Writer and “Good Observer” closely watching nations in Europe and US for best ideas for developing the modern society based on justice, good education system, and liberty (he used this word with caution being aware that too much of freedom leads to anarchy). 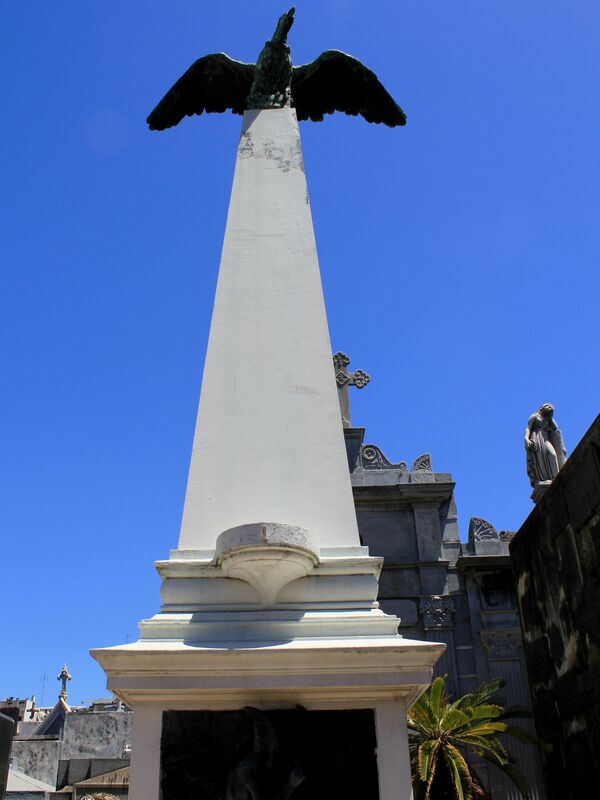 His obelisk topped by an Andean Condor (symbol of Power and Freedom) holds an inscription: Civilización y Barbarie” (Civilization and Barbarism). This is a clear reference to his tremendous work to move the country toward a modern, educated society ruled by law, compared to the brutal system maintained by cruel caudillos in the early years of the young Argentinean nation. 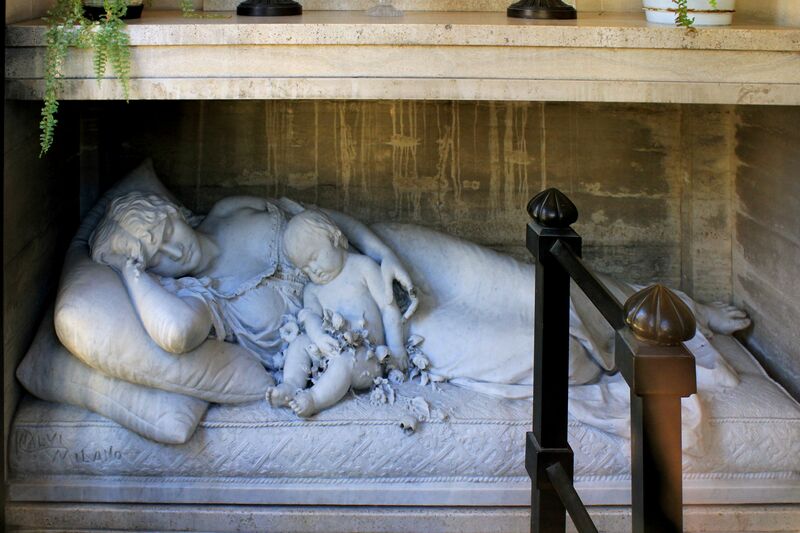 The marble stairs lead to the underground crypt holding the body of this illustrious man. 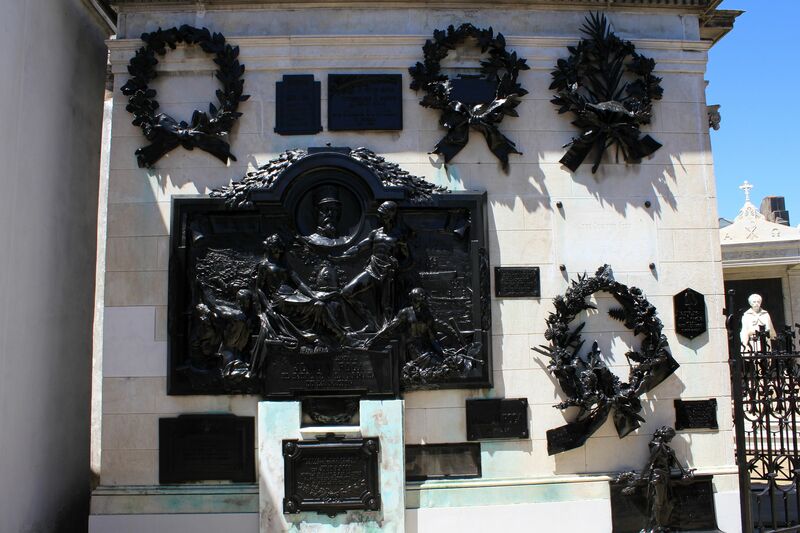 On the side wall next to the obelisk you can see numerous commemorative plaques with words of gratitude for his achievements….. 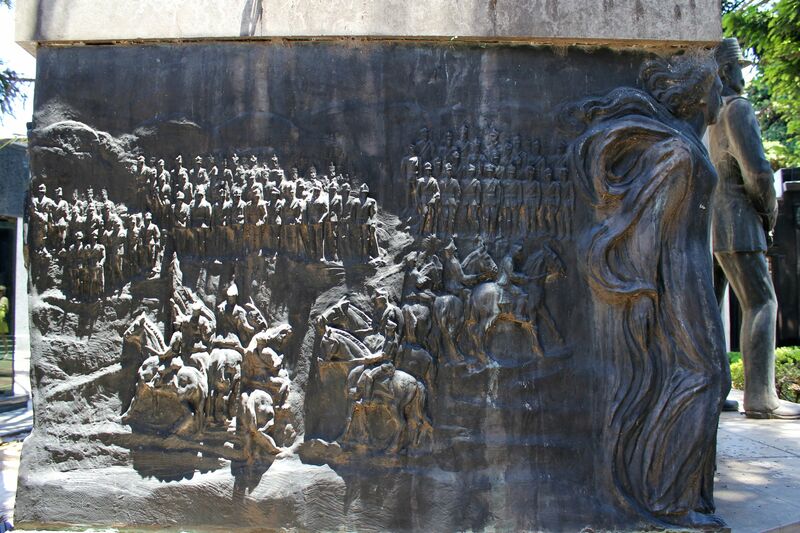 The statue of Pablo Riccheri and bronze panels on the sides of the monument are work of Luis Perlotti. 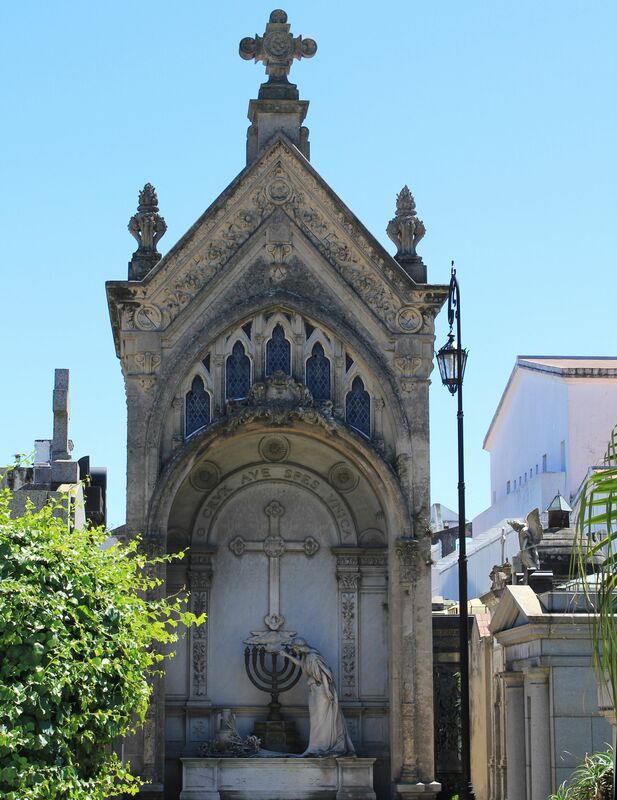 Art and history of Argentina in Buenos Aires necropolis. 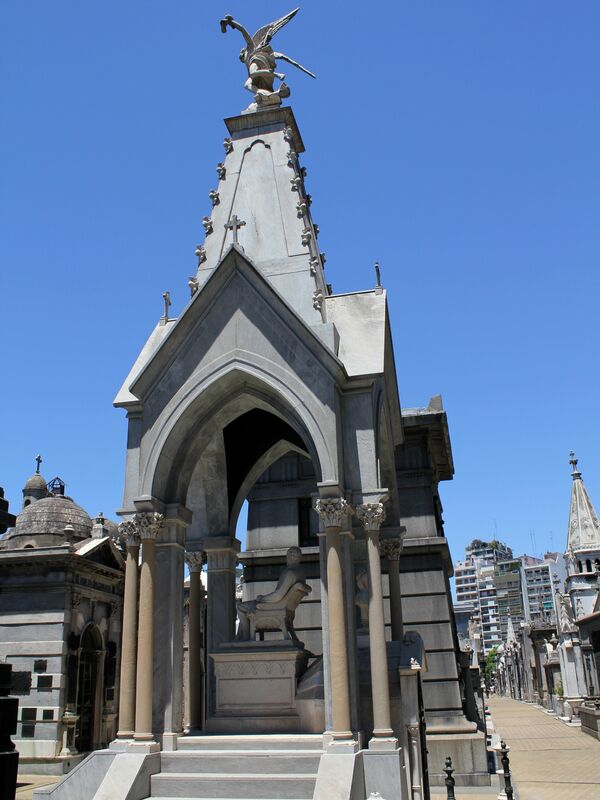 The mausoleum of the family Dorrego-Ortiz Basualdo was designed by the French architect Louis Dubois as a chapel. 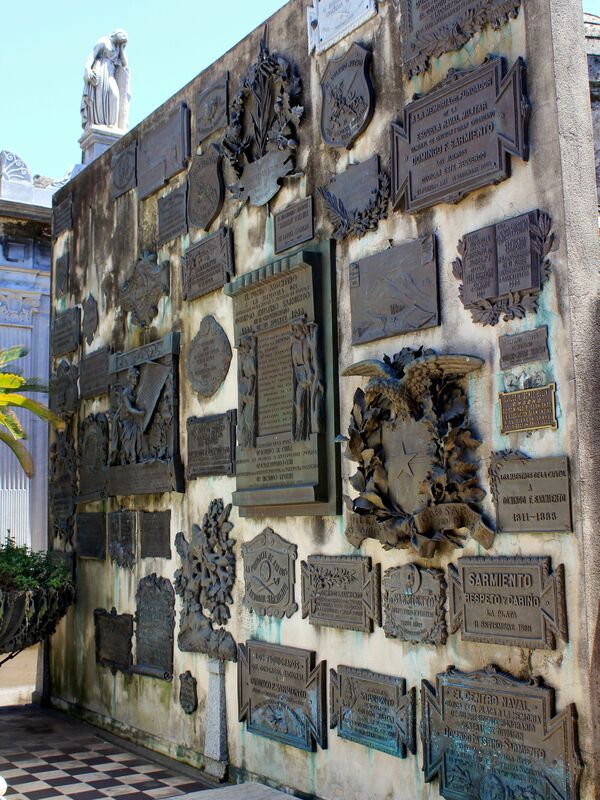 The lavishness of the mausoleum’s structure reflects an enormous wealth of the family Basualdo. In front of the chapel there is a richly decorated niche with symbolic scenes from the Gospel’s parable of wise virgins. The white marble statue of Virgin is a replica of the work by Italian Giovanni Villa. In the mixture of symbolism, the decoration includes a Latin cross with names of four evangelists and a seven-branched candelabrum that is one of the oldest symbols of the Jewish people … underlining the common roots of Christianity. 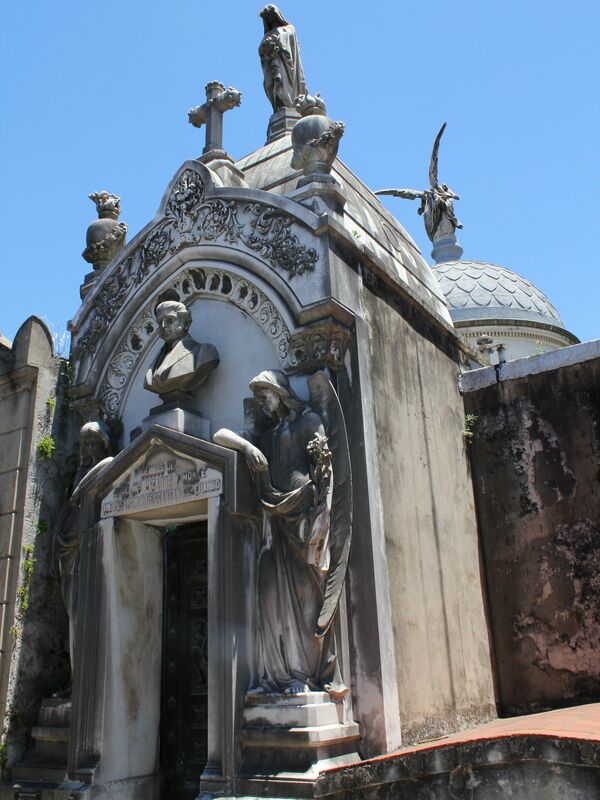 The tomb of the Roverano Family is a symbol of immigrants arriving to Argentina in a search for prosperity. It promises no more than opportunities and hard work (the inscription on the hull of the ship bringing immigrants to Argentina reads: “help yourself”). Roveranos were a good example of such fresh-blood immigrants, successful in business and in the same time generous in charity. Tomás Guido was one of the closest friends and supporters of the General San Martin. Hew was known as an excellent and experienced military strategist, skillful diplomat and negotiator. He took part in the famous meeting in Guayaquil of two Libertadores (Liberators) of the South America – San Martin and Simon de Bolivar. During his military and political carrier he was serving in the rank of Brigadier General as a Chief of Army and a Minister of the Government. His negotiating talents were crucial in reaching a peaceful solution in a dispute between Paraguay and US dissuading the latter from landing the naval troops in Asuncion. 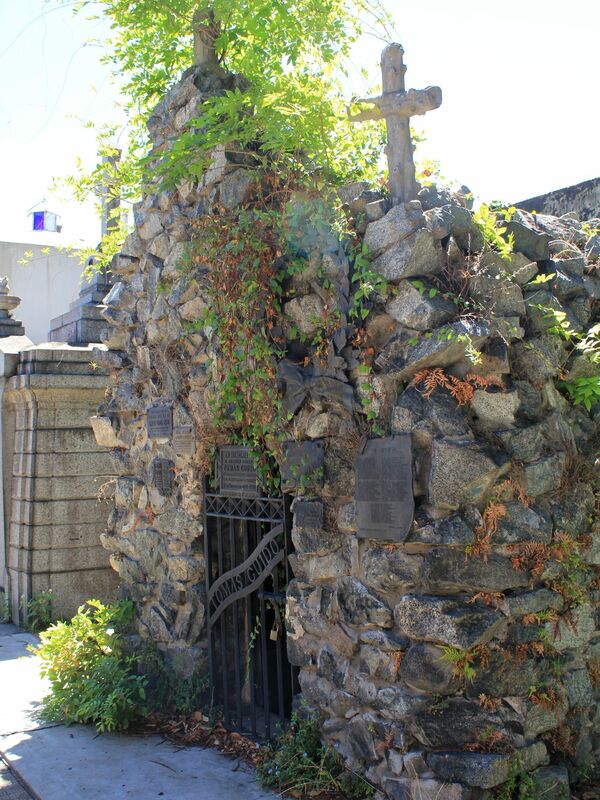 The grotto-like tomb – symbol of humility, was build by hands of his son - Carlos Guido Spano to pay a tribute to his father. 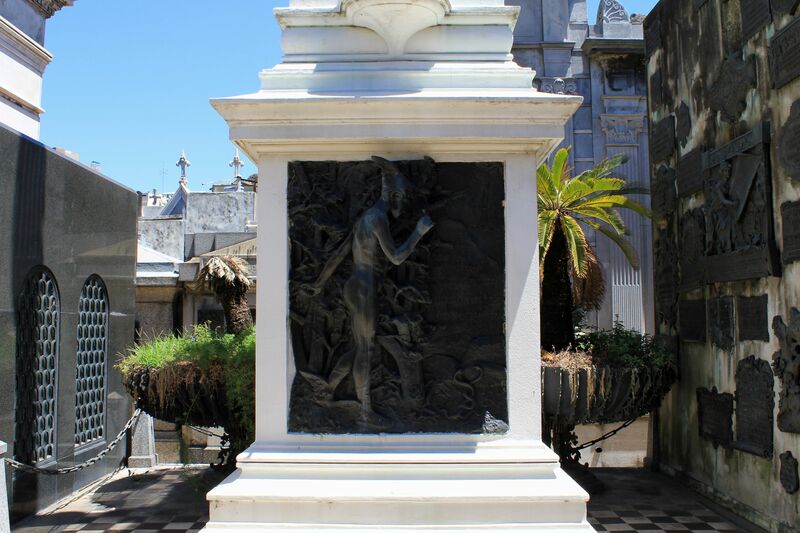 Now, after the remains of General Tomás Guido were moved to the Mausoleum of Heroes in the Buenos Aires’ Cathedral to rest at the side of General San Martin, the Recoleta grotto holds the body of the son - Carlos Guido Spano. The vault of Dalmacio Vélez Sársfield. Politician and an excellent lawyer and jurist, he is considered as a father of the Argentine Civil Code. Written in 1869, its major parts are still in use as the base of the current juridical system. He also wrote amendments to the Argentinean Constitution. 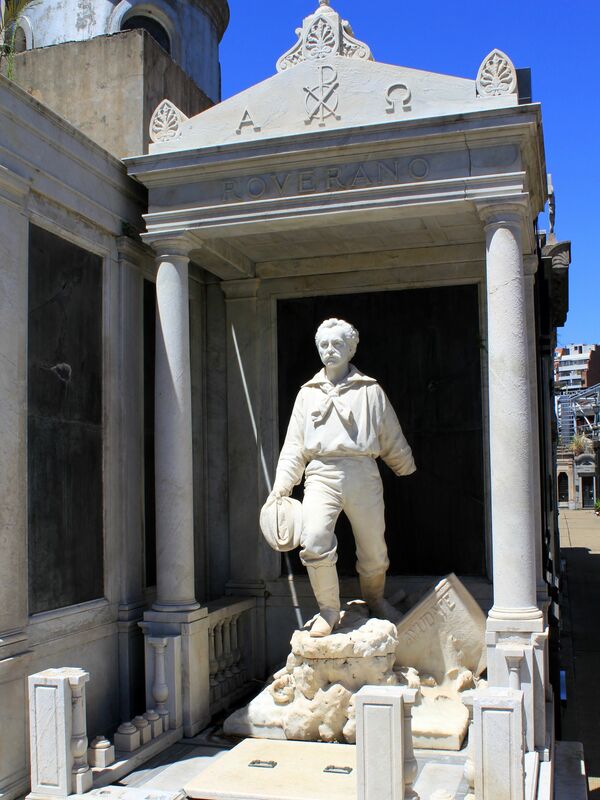 Mausoleum of Jose Maria Pizarro y Monje (He was a municipal official in the areas of Education and Public Health, a big donatore to public charity. 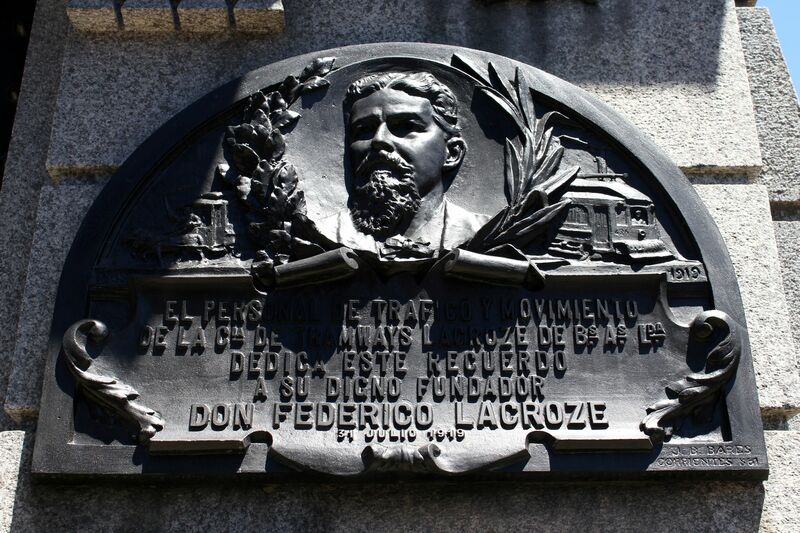 His wealth was later used to fund and operate the school for orphan children - "Instituto José María Pizarro y Monje"
He is one of the most respected personalities in the history of Argentina. Combining the military skills with that of journalist, poet and historian he was able to unify the divided nation under his Presidency. If General Jose de San Martin is called as the father of the Argentinean independence, Mitre is rightfully considered as the Father of the Nation. 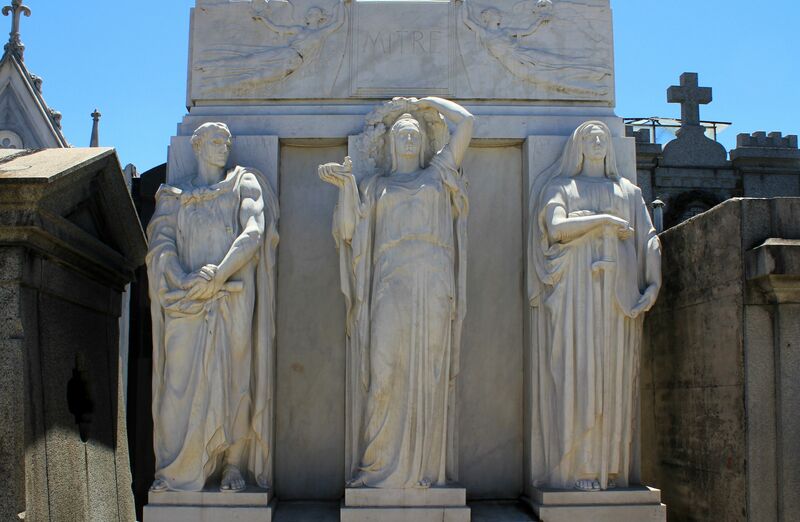 Three sculptures in front of his marble mausoleum are symbolizing believes and virtues he was serving during his life: “Liberty” (in the center) flanked by “Duty” and “Justice”. (sculptures were made by an Italian sculptor Edoardo Rubino). Modern vault of Robert Noble. Robert Noble was a prominent lawyer, politician and journalist. 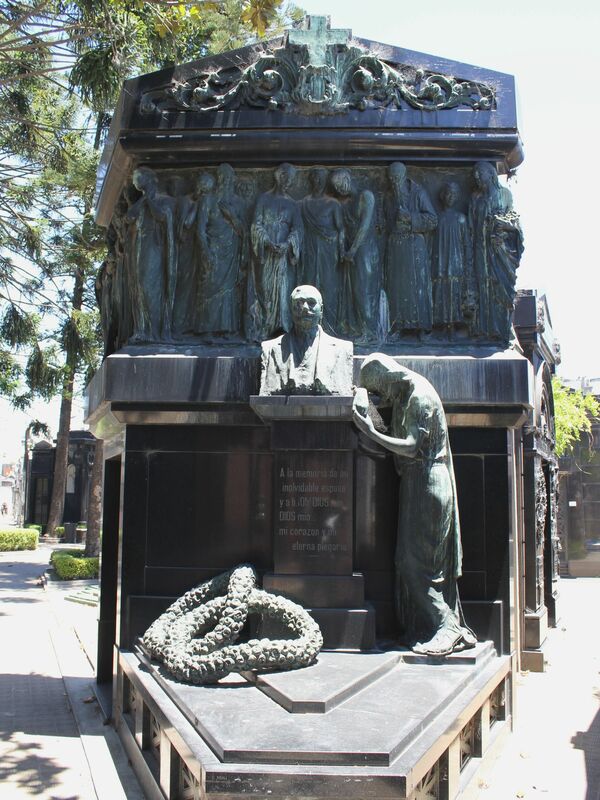 He founded the popular newspaper Clarin representing the left wing of the Argentinian political and social spectrum. The modern style - rectangular shape vault is made in granite with beautiful composition of stained-glass windows. 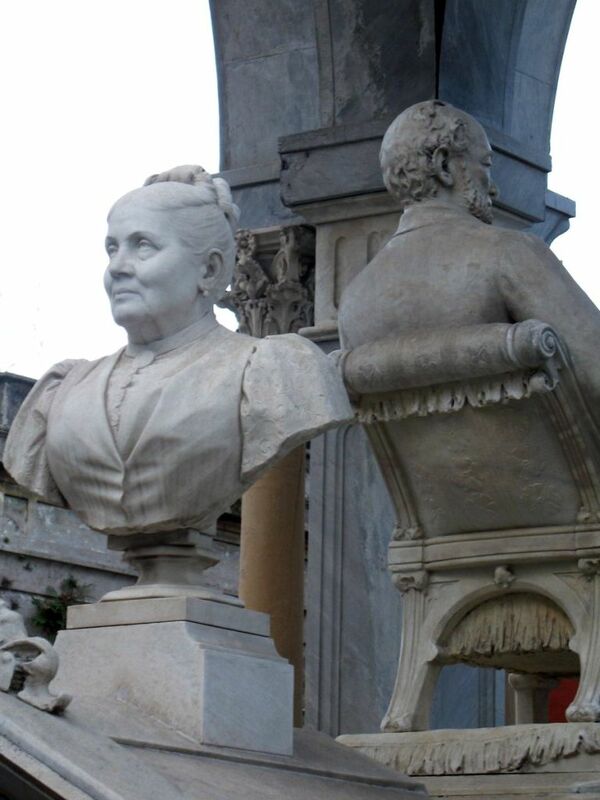 It was built by his wife Mrs. Ernestina Herrera de Noble. Please take your time wondering along the narrow streets of this city of “living dead”. 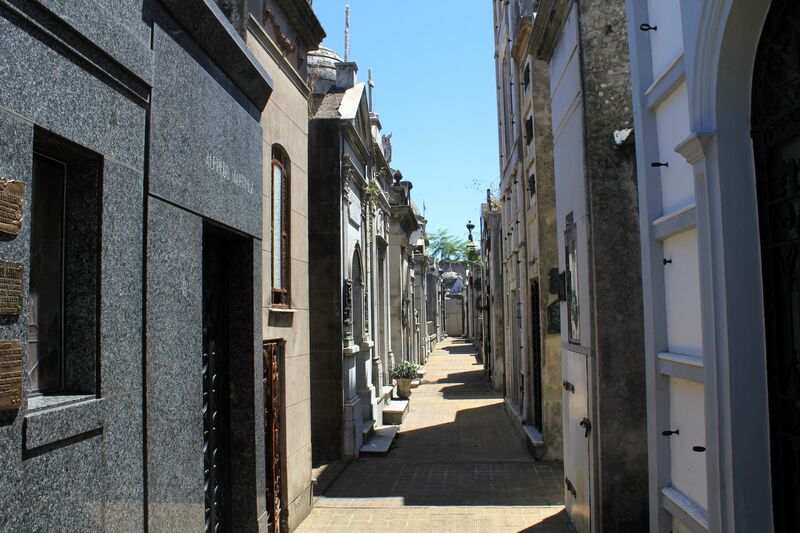 Living, because this cemetery not only fabulously blended timeless Art and History, but also in a sense a bridged the gap between Life and Death.